Today we had a barrel racing event. They had a good turnout, though not the largest we’ve ever had. We generally do have a good turnout. We’ve got one of the nicer arenas around, if I do say so myself, and David always does a great job with the footing. Even the warm-up arena is nicer than most. It seems I seldom get over there in time to catch an actual run. This time, David was working the arena between classes. I always do, though, enjoy snapping the racers themselves and their turnouts. I wish you could see the glitter as this gal and her beautifully groomed horse walked by. He was walking quietly, too, which is not always the case with barrel horses. The best, though, keep their horses calm and relaxed. It’s not my thing at all, but like anything else, it can be done well — or not. This is a very busy day. We have five horses supposed to come in, and one to go out. Then there’s the barrel races, which take up a lot of time and energy. One of the most important parts is getting everybody parked. Without supervision, they’ll all try to crowd in as close as they can get, and get each other blocked in. David’s very good at that, too. And . . . it’s one beautiful day, for barrel racing, or anything else. 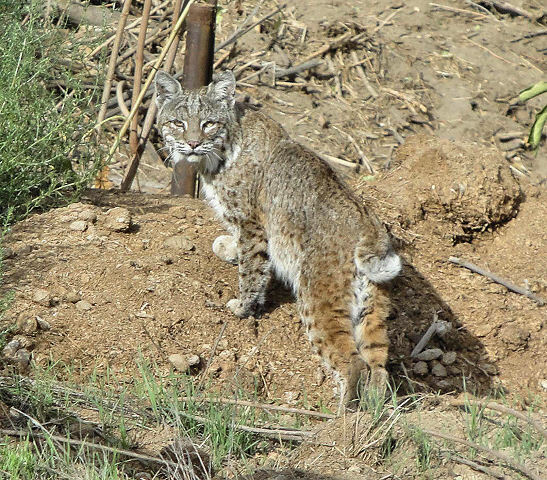 Donna F. — or her husband — sent me the bobcat pictures she took as promised. They are wonderful! You can almost tell what he’s thinking. “Huh. A horse and rider . . . non-edible . . . 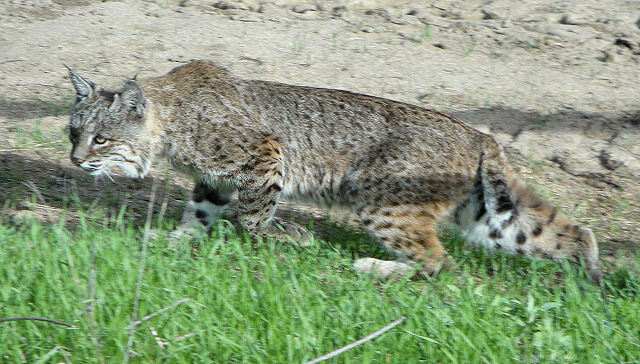 I have to admit, looking at these shots, that I could understand the desire for a bobcat coat. In the summer, most of those we see look reddish and nearly solid-colored, instead of plush grey and almost leopard-spotted. I wonder if that’s an individual thing, or due to the winter coat coming on. Ah, well; it’s very true that it looks better on the bobcat. She’s a good dog again. Last night she was barking down toward the new pens. She was so persistent that Billy finally went down and looked, to discover that one of the customers had forgotten to latch her pen, and her little palomino was out. She was only standing by her pen, looking bewildered, but she would have wandered off sooner or later. The Santa Ana is over for now, but it’s still dry and hot. 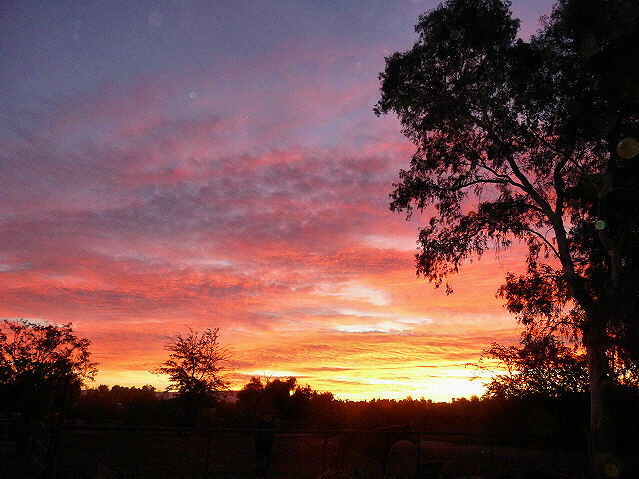 The air is clear, though, and the sunrise this morning was spectacular. The trees looked like black lace against the dawn. 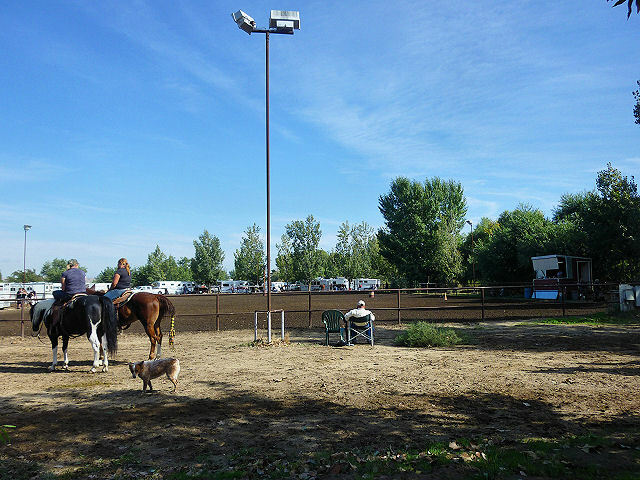 Later Bella and I walked over to the other side, and I turned her out in the big arena. It’s the only one I can turn her out in, other than the round pen, for fear she would zip right under the rails. The big one has two, so she can’t get under, but she did plenty of zipping. 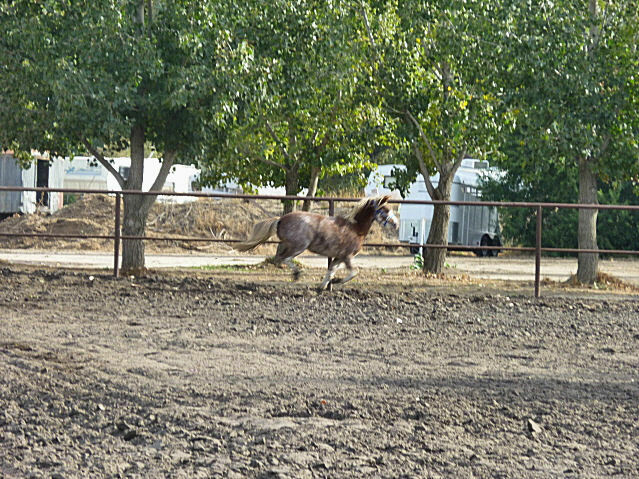 She was just a little roan blur, too speedy for the camera to catch well. Then we walked back in a different direction — a pretty good workout for a (not quite so) fat ol’ lady. My feet hurt by the time we got back. 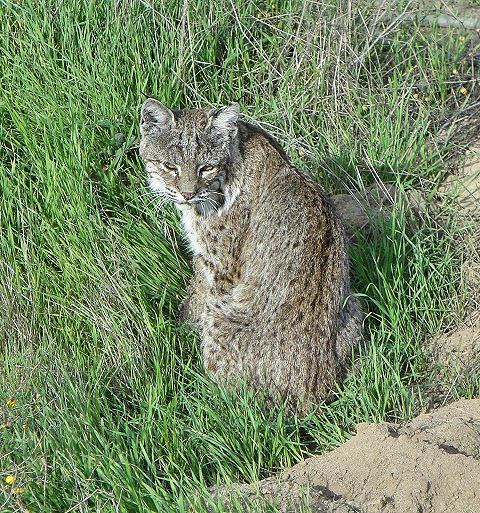 We missed the bobcat, though. Boarder Donna spotted it down by the new pens as she rode by. It was hunting in the bushes. She had her camera and snapped a couple of pictures; she promised to send some to me and I’ll post them if they make it. 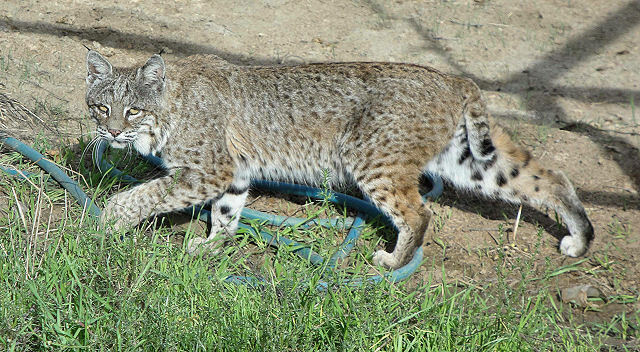 Luckily bobcats hunt bunnies and not horses. Or ponies. A Santa Ana wind has been blowing for more than a day now. For those who don’t know (lucky people) a Santa Ana is a southeast wind. A hot, dry southeast wind that blows in from the desert. The humidity is in single digits; people and horses are prickly and restless. It’s a wind without a lot of virtues. It’s slowed a bit now, but the temperature is around eighty, and there’s a lot of static electricity in the air. In the mountains and down toward L. A., everyone will be keeping a wary eye out for a sign of smoke. Some of our most disastrous fires have been fanned by a Santa Ana wind. There’s supposed to be rain on the way by Friday night or Saturday, but sometimes the clouds are blown to bits before they get to us. Here’s hoping for a little wet stuff, at least! Anyone who read this blog for a while knows that I am interested in horse colors. The myriad colors horses come in, and their genetics, are a fascinating subject — at least to horse people. 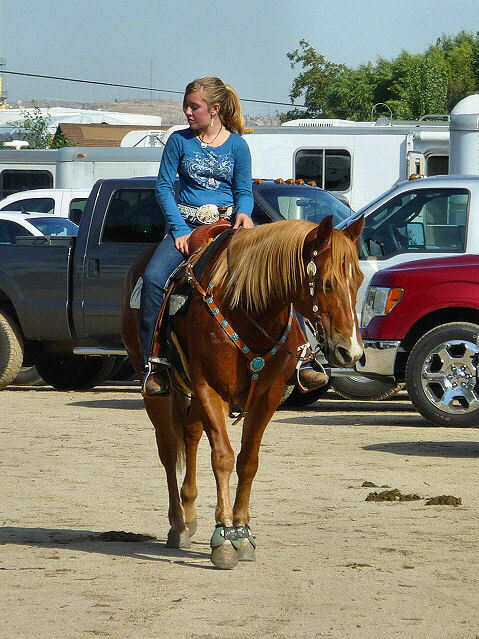 When I first saw Bella’s picture, I would have called her a chestnut roan. When I sent in her papers for the transfer of ownership, I noticed that she was (more correctly) described as a chestnut sabino with roaning. What’s the difference? Well, here’s a shot of Duffy. He is a true roan. Notice that his head and legs are dark, without even minimal white markings. The white hairs are more or less evenly distributed throughout his coat, with only a few dark marks. 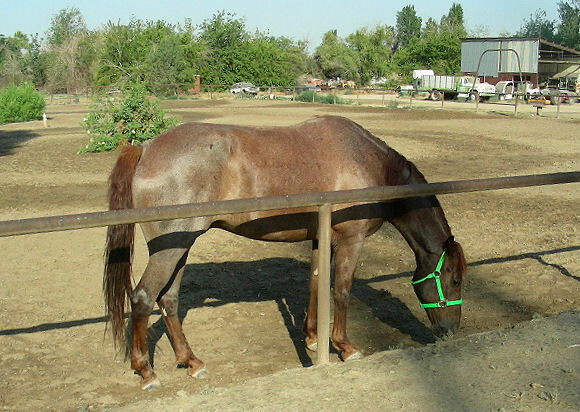 These are thought to occur in roans as a type of scarring. Now look at this shot of Bella. Lots and lots of white markings there; all four legs and a big bald face. There’s lots of roaning, but it’s not evenly distributed through her coat, but heavier along the flanks and belly. Notice too that the white on her legs runs up towards her body. This is the pattern that has come to be known as sabino. True roan is not found in many breeds. Sabino is found, for example, in Thoroughbreds, where roan is not. If you breed sabino to sabino, you may get so much white that it appears to be pinto. Once in a while, you will get an all-white animal, or one with only the ears dark. There have been several white Thoroughbreds, and they have seemed to be sabino white. They look very striking on the track, but haven’t been strikingly fast. A very good book on the subject is called Horse Color Explained, by Jeanette Gower. The author is Australian, so many of her terms are different from ours, but she explains all of them. 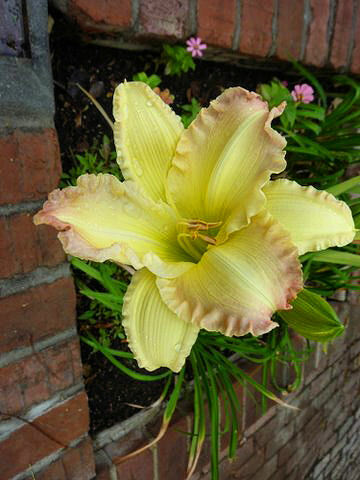 Included are such rare colors as brindle and champagne. 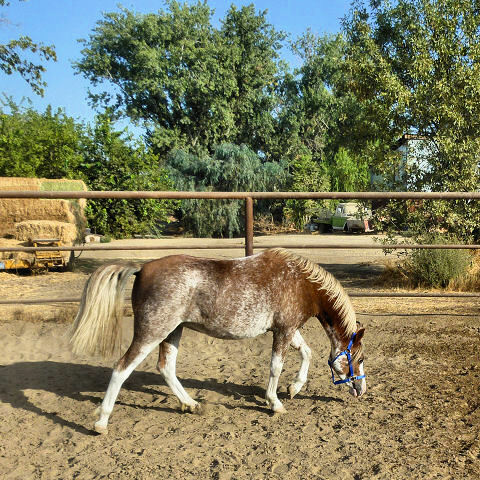 The section on the sabino gene is extensive, and includes pictures of a “pinto” thoroughbred stallion, and a white (not grey) Arabian. The subtitle of the book is A Breeder’s Perspective, and it includes information about genetic problems linked to color. Horses with a “splash white” gene may well be deaf, for example, though the owners may never realize it. There are other combinations that are lethal, with foals dying at or before birth; so it’s as well for breeders to know a little about color. I found it interesting to see how many color terms come from the Spanish language. Palomino, grullo, sabino, rabicano, cremello — they have terms for color English doesn’t. That’s one of the great things about the English language, though — we’ve never hesitated to adopt useful words from other languages. Andrew was schooling his dogs as I walked by this morning, so I stopped and took a couple of pictures. It looked like it was going well, though they were somewhat hindered by Skip the pointer, who wanted to Help in the worst way. The very worst. Courtney finall penned him up. 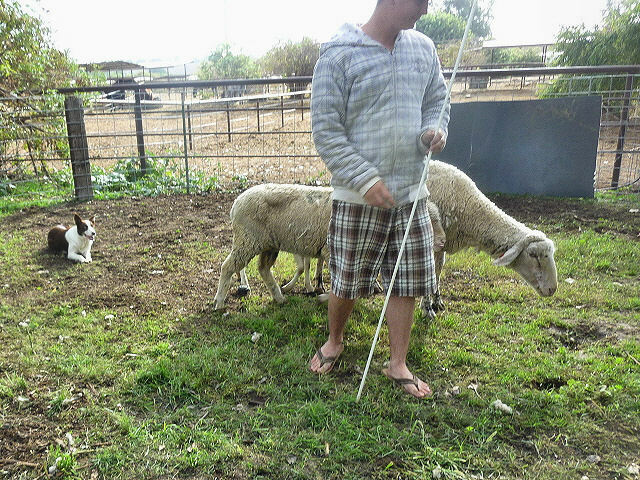 The main thing at this point, Andrew explained, was to have the dog keep the sheep between herself and her human. Gena seemed to do that pretty well. He used the long . . . well, it’s not a whip, and it’s not a stick; I’ll say pointer . . . to turn the sheep and cue the dog. Especially since she might have been distracted by Skip and Spanky’s eyeballs bobbing up and down as they leaped, trying desperately to see what was happening on the other side of the fence. 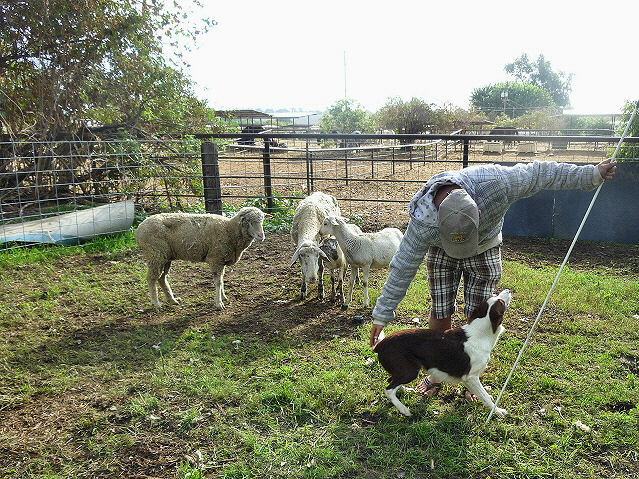 Sheep, however, tend to get a border collie’s full attention. David welded in the uprights for the shelters in the new pens today. 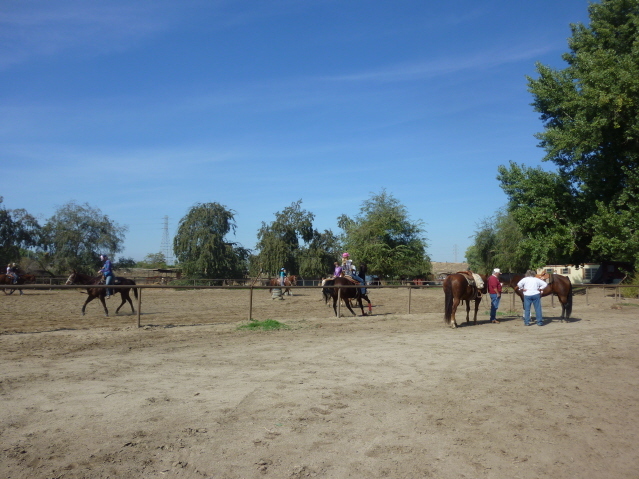 The horses seemed quite undisturbed by all the activity; however, when it comes time to hoist the roofs into place, they’ll turn them out in the round pen or the arena. First, though, they’ll put in the crossbeams. I’ll get some photos soon. It was a beautiful, cool, breezy day; Bella and I enjoyed our walk. I’m afoot for the next three days or so — the little blue Beetle is in for a paint job. I did a lot of shopping yesterday, but as soon as I gave up the keys I started thinking of stuff I needed. I was kind of thinking of a new Beetle, actually, but I have to agree with Billy. Mine doesn’t have forty thousand on it yet. It’s a practically new . . . 2001. The paint job ought to spiff it up a bit, anyway. I’ve been getting some really nice pictures from other people. 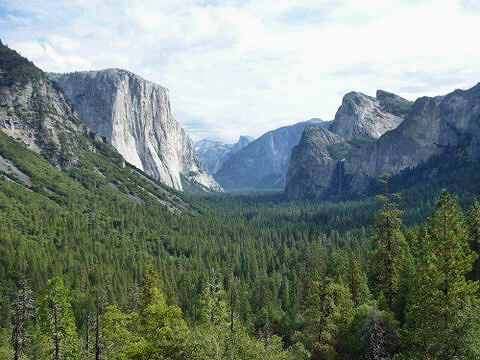 Marion took a trip to Yosemite . . . this classic view looks just like a postcard. She also sent a picture of her Beautiful Edgings. It’s as pretty as mine. I got an e-mail from sister Sally. Her Emily (13) has a boyfriend. His name is Dylan, and he’s pretty cute — and very polite. 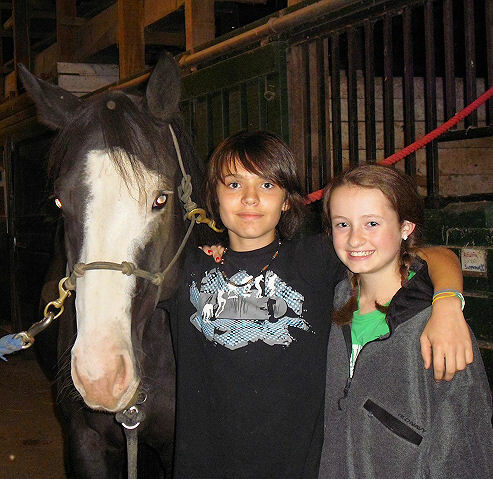 His mom Kerry has horses, and here they are with Lassie. I mentioned, a while back, the annoying news Billy had that helped precipitate his nosebleed. We got the news that the EPA, in its infinite wisdom and experience, had decided that our Green Waste facility could no longer take horse manure. They were taking it free, composting it with plant materials, and selling the resulting compost. Now we are supposed to take it all the way to Bena Landfill and pay a fee to have it buried. It started at fifty dollars a ton, but the landfill people (who aren’t any happier than we are) got it down to twenty. Two hundred eighty-plus horses make a lot of manure. We figured we’d have to go up five to ten dollars a month to cover it. Billy hates to raise the rates. We’ve been at one-fifty for a long time, and we’re doing just fine. Anyhow, it seems we can haul it to Shafter, where they haven’t started charging yet. Of course there’ll be additional mileage, but we should be able to absorb that. So no rent hike for now. But we’re afraid they’ll get to Shafter. Sigh. Bella has settled in nicely to her new pen. Today she wore her bit and bridle, and longed in both directions at walk and trot, halting on command. I think she’s ready to do more. She’s sure been a pleasure to work with so far.